My son got a kayak. He did all the research online and went with his Dad to pick up his new boat. Now he's found some kayaking groups online. 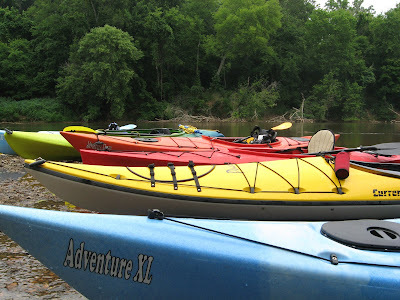 He got in touch with one kayak group (High Rock Lake Canoe/Kayak Club), and they invited him to join them yesterday on a local river. The kid had a great time (as you can see in the trip photos). He was really excited about a snake they saw slithering across the water (captured on video). 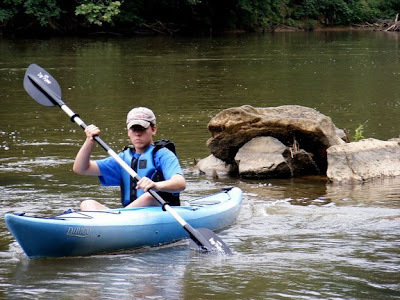 He also enjoyed the class I and II rapids. After the kayaking trip, the kid-o took a nap. I grilled up some beef kabobs. He put a hurting on the kabobs after he got up. Your son was pleasant to have along on the trip. Maybe you join us on a future outing. 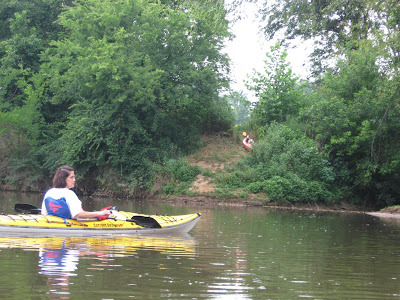 Our favorite run will be coming up on July 5, Yadkin River- Hwy 64 to 801. This is the most scenic of the areas we have paddled to date. Glad to see a fellow blogger. Hi Neal - He had a great time and was showing me your web page, photos and videos. Neat! Thanks for making some photos of Eli too. All his were of the boats - or most. I love water sports as well. We only have the one kayak though. Looking at a second soon I hope. Eli will be at camp on the 5th, and I'll be at a family reunion in the mountains. But hopefully we can both go on a trip one day soon. Nice to meet you online (-: Great job on your web sites and extra data on the trips. If anyone likes to grill out, that's what I write about there. 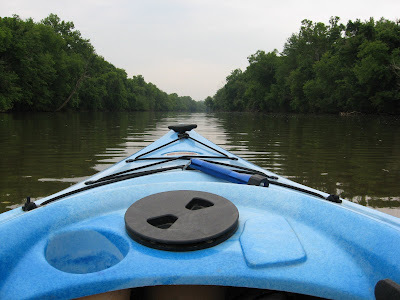 Wonderful video of your son's kayak trip! You felt like you were right there with them. I would love to find a group to join here in Vermont! Thanks! I think maybe Neal took the video. Not sure. I'm not sure how my kid found that group, but he sure had a good time. Thanks for sharing the comments about the video. I used the movie feature on fine digital camera. We always hope that our pictures will give a viewer the feeling of being there themselves. Should SCGregory ever visit, they are more than welcome to join us on an outing. Tell them not to worry about bringing a boat, we can usually find one. I thought you probably did the video. Great job. We have The Flip - a little digi recorder. I think the Canon camera also will make video. Need to play around with those features. I've posted one in the blog, but I need to work on that. On a side note - Eli said that he found the kayak group on Craig's List. So maybe that will work in Vermont as well. Hope so.